Memorising guitar scale patterns can be a long and tedious process. But it needn't be so! Fortunately, music has built-in shortcuts that allow us to derive multiple scales from the same pattern. You may already be aware of this on some level, but just need a clear process to finally see the complete picture. The concept of one pattern covering multiple scales is not a new one, but it is one that I don't see taught enough. Instead of memorising the notes for every single scale, in every key, we can drastically cut the amount of time we spend on that first crucial stage - learning the roadmap - by seeing these scales as part of a "three parent system". Those three parent scales are: the Major Scale, Harmonic Minor and Melodic Minor. These can be translated into three core patterns that give us the roadmaps for the most commonly used scales in pop, rock, metal and jazz, and over the most commonly used chords and progressions. Each of these three parent scales has seven degrees. Each degree marks the root or "starting note" of a new scale (or mode). So, 3 x 7 = 21 potential scales to use in your music! Some of these scales will be used more than others, and some you may never use. But even if you only used eight or ten scales from this "3 parent system", you'll still save loads of time by visualising them as part of the same three roadmaps/patterns. Alternatively, I break these patterns down in The Ultimate Roadmap e-book, which expands on this lesson, if you prefer to have everything in one place. For most major and minor key music, the Major Scale is the most important of the three patterns. I also say minor key, because the Major Scale pattern covers the Natural Minor scale - the most commonly used minor key scale (from which minor pentatonic is also derived). It also covers another common minor scale/mode - Dorian. For jazz and more "exotic" music, Harmonic and Melodic Minor will give you the roadmap for additional scales, and some that are less commonly used (but beautiful nevertheless!). Scales such as Phrygian Dominant, Lydian Dominant, diminished and altered scales can be found within these two core patterns. As demonstrated in the video, each scale has its own root connection with its parent scale/pattern. In order for this to work, you need to have learned the notes on the fretboard, at least on the 5th and 6th strings. This is something I recommend you do in the beginner stages of your learning journey, so if you've followed my lessons, you should already have this covered! So we can see, for example, that if we wanted to play C Lydian, we'd simply use the G Major Scale Pattern. If we wanted to play C Mixolydian, we'd use the F Major Scale pattern. BUT... memorising all these notes would prove very time consuming for most of us, and it's good to have a more visual representation of these root connections on the guitar neck. Below are these root connection points in movable relationships. That means they work no matter where you position the root of the scale you want to play. The second mode of the major scale. So it "begins" on the 2nd degree of its related Major Scale pattern. Dorian is an especially versatile minor scale, as it can be used over most instances of a minor chord (e.g. D Dorian over Dm). So, for D Dorian, we'd play the C Major pattern (starting on D). For A Dorian, we'd play G Major (starting on A). When I say "starting on..." I don't mean we have to begin our licks on that note. But being aware of the root of the scale/mode you're playing will help you to keep your bearings within the pattern. Phrygian, sometimes called Phrygian minor to distinguish it from the similarly named Phrygian dominant, is the 3rd mode of the major scale. Therefore, it starts on the Major Scale's 3rd degree. It's often described as having a Spanish, flamenco or middle eastern sound, because of its traditional use. But you'll also hear it used in heavy metal (e.g. over power chords) as it has a dark, tense quality because of its ♭2 interval. The fourth mode of the Major Scale, and therefore starts on the 4th degree. Lydian has a mysterious, ethereal quality because of its ♯4 (augmented fourth) interval. It works over major and maj7 chords. Mixolydian is a bluesy, country sounding major scale that sounds most at home over dominant seventh chords (e.g. G7). It's the 5th mode of the Major Scale, so begins on the 5th degree. The 6th mode, therefore begins on the 6th degree. 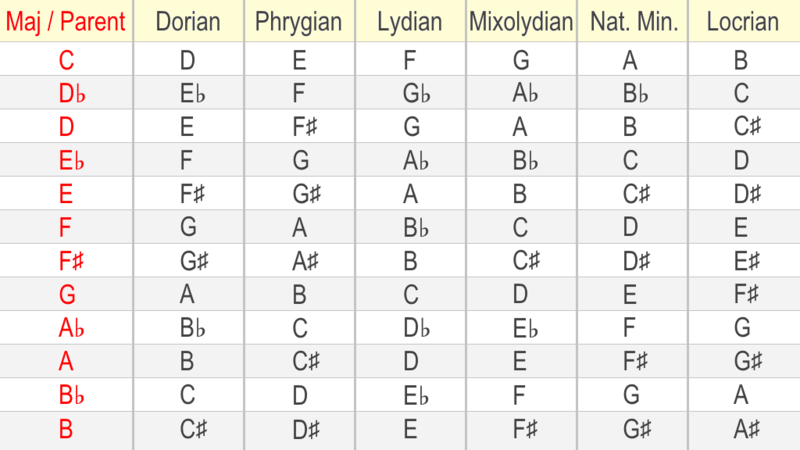 The most common minor key scale. So if you're playing over a song in the "key of A minor", for example, try A Natural Minor. Nine times out of ten, it'll work over all the chords in the progression, or at least most of them. The "odd one out" because it's not major or minor like the other scales. It's diminished! Specifically, it works over half diminished seventh chords (often written as "m7b5" or "minor seven, flat five"). For example, F# Locrian would be a fine choice over an F#m7b5 chord. You can learn more about diminished chords here. So that's our first seven scales/modes covered. By learning the core Major Scale pattern, you'll have all these six related scales covered right across the neck for any key. 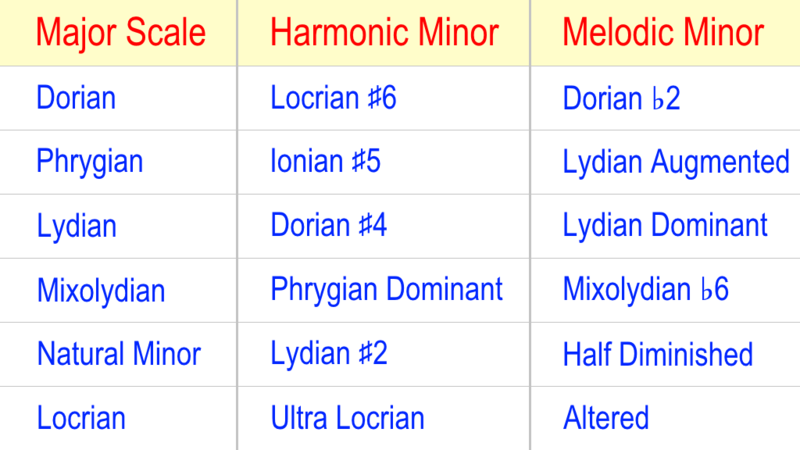 But there are two other parent scales - Harmonic Minor and Melodic Minor - that give us some more "exotic" sounding scales such as Phrygian Dominant, Lydian ♯4, Altered Scale and many others. 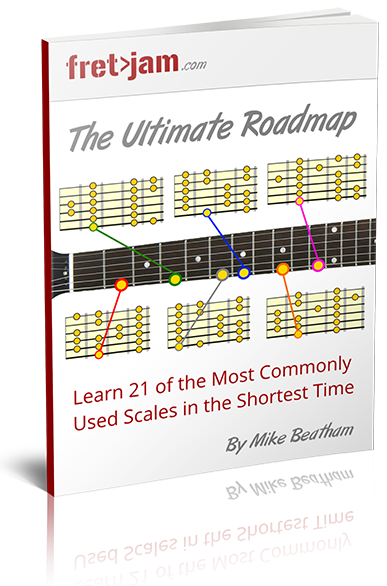 I cover the complete 21-scale system, including breaking down the large patterns and how to connect the scales to chords, in my e-book: The Ultimate Roadmap. Get the complete lesson here.